The rare and CITES protected bird, is the biggest Psittacidea species existing, which up to 30,000 US$ are offered on the black market. 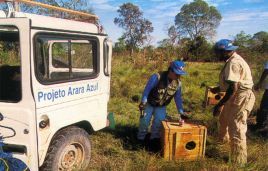 However, thanks to the successful projects of wildlife biologist Neiva Guedes, the bird is now safe from extinction in the Pantanal. 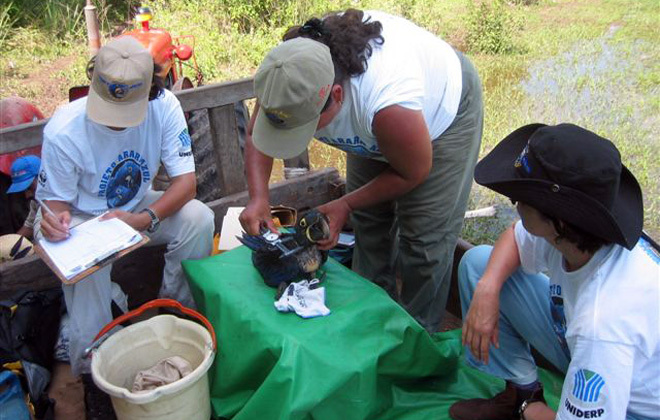 Only small groups or individuals are accepted, from September to October, to assist and help with the projects. Visitors personally support NGO with donation. 5 days on site plus 5 days Pantanal Wildlife Safari. we would like to thank you for the perfect organization of a great holiday with wonderful impressions. 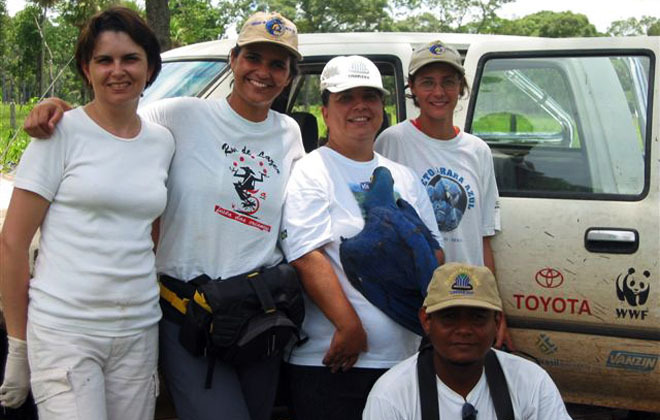 The Iguaçu Falls were fantastic highlighted by the helicopter flight,the fast boat ride right through the falls and the birds park "Parque das Aves" where you had arranged a meeting with Dr. Anna Groukamp for us. The unsurpassed highlight of the trip however was the Pantanal . A world class destination for wildlife watching. 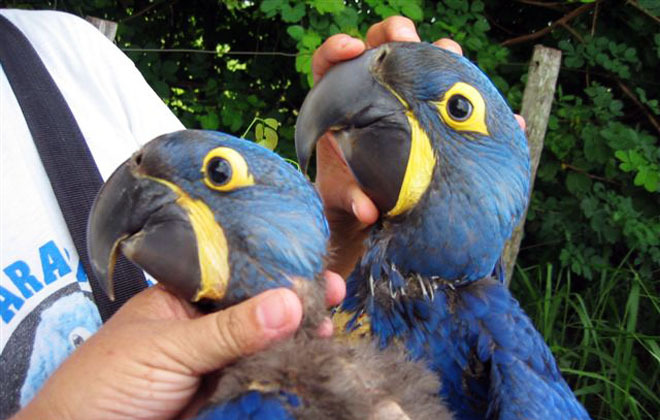 We will never forget how easy it was to observe the three big macaws. As breeders of the Hyacinth macaws our main interest stayed with this bird but also the Green-winged and Blue-and-yellow Macaws were all around us. Toucans, parrots, parakeets, nesting Jabiru giant storks, pink spoonbills, a great variety of egrets, ibis, woodpeckers and birds of prey, even eagles were permanently flying around us. Also Rheas, Siriemas and Southern screamers were always present ad very close to the Fazendas facilities.But we also had the opportunity to watch Cayman, Giant armadillo, Cabiparas the biggest rodent on the planet.The 4x4 vehicle took over the whole extensions of the 12000ha big property, but we were able to observe much of the wild life on foot right, behind the fazendas main house. 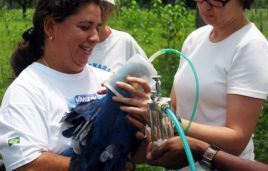 Besides of the Hyacinth macaws, the other highlight was that we were invited to participate on a conservation project with the Tapir, conducted by an international NGO at the fazendas facilities. 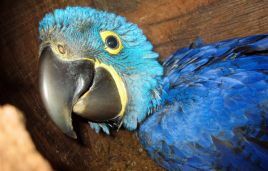 In the early evening hours, when we returned to the Fazenda we were amazed about hundreds of macaws and ibis taking their sleeping place in the buriti palms surrounding the Fazenda. I made over 1000 photos and produced a great video of this incredibly beautiful paradise, called the Pantanal. Dear Peter, this trip is unforgettable . Thank you very much. Certainly we will see you again, maybe in the Amazon ?